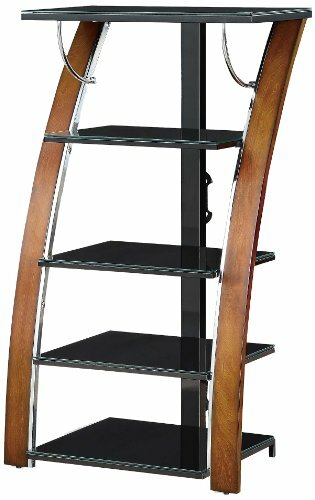 Sleek audio/video storage tower with dramatically angled bent plywood legs is ideal for use with matching console or alone to add storage and display space to any home theater arrangement. Versatile enough for use in a contemporary office setting for storing and displaying books, photos or computer peripherals. Wood legs are finished by hand in warm Tuscan brown hues. Shelves are black tempered glass that lets light in for open, bright look and are also easy to clean or dust. Whalen designs, develops and delivers quality home furniture that are rich in the value, trend and innovation. Our manufacturing expertise is highlighted by time-honored construction techniques using quality wood materials, metal, glass and upholstery. Every Whalen product incorporates industry-best features at a cost that provides today's families freedom and options when decorating their home or office. Designed for today and built for tomorrow, each piece of furniture is created for the way you live and work. Whalen products deliver. If you have any questions about this product by Whalen Furniture, contact us by completing and submitting the form below. If you are looking for a specif part number, please include it with your message.